The majority of the sprinkler systems in South Florida suffer from inadequate distribution uniformity. Poor distribution uniformity means that some parts of the lawn receive essentially no water and the sprinkler system must be run several times longer than if it were working properly to provide a little water to all corners. In a survey of 211 lawn sprinkler systems, by the Mobile Irrigation Lab at the South Dade Soil and Water Conservation District, 85% of lawns were reported to have a distribution uniformity of less than 70%. Excess irrigation is harmful to lawns as well as the natural environment. It only takes 3/4 inch of water to saturate the turf root zone and avoid excess. More than this amount will leach nutrients and pesticides into the aquifer, and by runoff into canals. Areas of the lawn that are over-irrigated, due to poor distribution uniformity, are often infested with water loving weeds such as dollarweed, and are treated with herbicides to bring them into check. According to the Mobile Irrigation Lab, the majority of irrigation problems are maintenance related, not design problems, and the list includes blocked water streams, mixed sprinkler sizes and clogged emitters. With nothing more complicated than a tune-up, the vast majority of home irrigation system can generate large savings in irrigation use. Additional large savings can occur from simple practices, such as not watering when it is raining. Rain shut off devices can be used to disable automatic watering cycles. Single-event timers can also be used so that a conscientious decision must be made to irrigate when the grass shows signs of wilt. To achieve 3/4 inch of irrigation to all areas of the lawn, the properly tuned sprinkler system is adjusted to provide a duration of application based on the precipitation rate of the sprinkler heads used. GOAL: To keep water in root zone, and to reduce excess application of water and retain storm water. 1. Shut it off. Let your grass tell you when to water. The lawn may show a little wilt for several days in the late afternoon, and you can then irrigate at the first allowable opportunity. Ask about the availability of single-event timers, to allow you to make a conscientious decision each time you irrigate. 2. Irrigate the lawn to provide approximately 3/4 inch of water, to just replenish the root zone. Depending on the type of spray heads and their spacing, this may be as short as 13 minutes or as long as 30 minutes. Rotary heads typically require longer intervals, 45 minutes to 1 hour, which can be determined only based on system characteristics or a catchment can test. 3. Test your system ("catchment can" test). Scatter 20-30 drink cups or coffee cans throughout the landscape, run the zone for a defined period, e.g., 30 minutes, and measure the amount in each cup. (See sidebar on "Catchment can test.") The results will tell you how long you must irrigate, and will pinpoint problem areas for maintenance or redesign. Periodically re-test your sprinkler system, inspect spray patterns, and ensure uniformity of watering by providing overlap with head-to-head coverage. 4. Use a rain gauge and turn off your time clock if your lawn has received 3/4 inch of rain. A rain gauge is a useful reminder that most of the year in Florida, Mother Nature gives the lawn all the water it can use. A daily recording of rain gauge readings is also a way to teach children about the cycles of nature and the importance of consistency in care for the earth. 5. Add a rain shut-off device to your sprinkler system. Such a sensor overrides the normally scheduled irrigation, whenever sufficient rain has occurred. This is helpful if you plan to be away from your home. 6. Remind your neighbors. 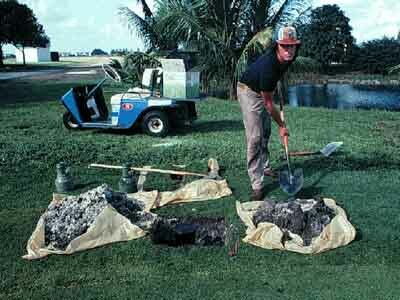 Talk about Florida's wet-dry cycle, and about everyone's responsibility to respect and abide by irrigation laws. Encourage your municipality (or the county) to enforce irrigation laws. 7. Make sure the people you hire to install and repair your irrigation system are licensed professionals. 8. Adopt performance standards. Irrigation systems, when they are installed, should meet targeted efficiency and uniformity of application criteria. 9. Lay out irrigation systems efficiently to attain high uniformity. Use sufficiently large pipe size to keep pressure losses at a minimum, and to help achieve uniformity. Establish separate zones for turf and ornamental plants. Place rotary heads and spray heads in separate zones. Make sure that all sprinklers are placed as closely as recommended in manufacturers' specifications. This normally requires that the radius covered by one sprinkler head should just barely reach the adjoining sprinkler heads, that is, they will completely overlap. 10. 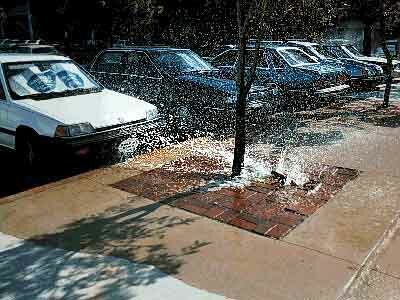 Clean out clogged sprinkler emitters, and remove obstacles and low overhanging branches that block stream flow. Raise any sprinkler heads that do not clear the turf canopy, or use popups. Replace any heads and fittings that are broken or cracked. Use partial (half- or quarter-circle) heads to replace full-circle heads that overspray onto the street or buildings. Consider adding heads in areas that do not receive enough water. The solution to dry spots is to fix the irrigation in that zone, and not to over-water the rest of your property to compensate for poor coverage. 11. Vary irrigation schedules according to season. November through February, water at most once every seven days, March through May, two times per week, and June through October, two times per week, always depending on rainfall. 12. Vary irrigation schedules depending on grass type. For example, bahiagrass can be maintained year-round in level areas with no irrigation. However, at the opposite extreme, golf greens are shallow rooted and require daily irrigation, and areas overseeded with cool-season grasses may need to be irrigated briefly five times per day during the first two weeks after emergence. 13. Water your lawn infrequently and deeply. Frequent shallow irrigation encourages a shallow root system, which has a small soil moisture reserve, and will make the lawn more susceptible to drought. Infrequent irrigation also fails to take advantage of the fact that it is rarely dry for long in south Florida, and by waiting a little longer for rainfall, it is possible that you will not have to irrigate at all. Grasses that are overwatered go into a condition of luxuriant water use, when they actually use more water. 14. Capture and recycle rainwater for use on turf, thereby reducing reliance on city water. For example, raised road areas can avoid the use of hard curbings to allow water to run off into the landscape. An approach for parking lots is to interrupt curbings with gaps that permit drainage into the landscape. 15. Abide by all Municipal, County, and South Florida Water Management District restrictions. In case of conflict, the more restrictive water use ordinances must be abided.